Researchers at the Ecosystems Center have a long history of studying coastal ecosystems. Coastal ecosystems are rich in nutrients, such as organic carbon and nitrogen from decomposing and living organisms. These ecosystems show visible physical (tides, turbulence, etc.) and biological (algal and bacterial growth, fish and insect populations, etc.) responses to human and natural disturbances, making it easier for scientists to measure the impact of these disturbances. The land and sea along the coast of Massachusetts are especially good places to study coastal ecosystems because of the coastal geography and diversity of fresh and saltwater systems, allowing researchers to study several types of coastal systems without traveling far. 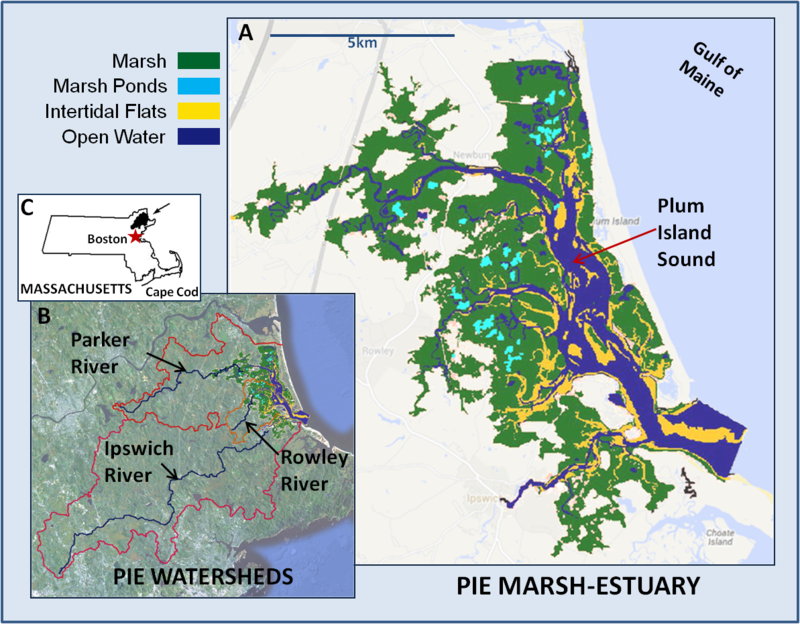 In the late 1980s, Ecosystems Center researchers started studying the Plum Island Sound estuary, a marshy region where several rivers meet the Atlantic Ocean in northeastern Massachusetts. The US National Science Foundation (NSF) created a Land Margin Ecosystem Research (LMER) program in 1988 to study the boundary of terrestrial and marine systems, and awarded a grant to researchers studying the Plum Island Sound coastal ecosystem in 1992. The LMER program resulted from a workshop held at Woods Hole, MA, in 1987 that stressed the study of land margin systems. The LMER program first included four coastal research sites in the United States, including Chesapeake Bay, Tomales Bay, Waquoit Bay, and Columbia River. This network of research sites allowed researchers to observe and experiment on different systems, and to compare the data and responses between sites. Led by John Hobbie, researchers at the Ecosystems Center applied for NSF funding in 1992 and 1994 to coordinate scientists within the LMER program. They used this funding to organize workshops, a newsletter, and directories of scientists involved in the LMERs. The group of Ecosystems Center researchers participating in the Plum Island Sound LMER in 1992 included Charles Hopkinson, Brian Fry, Linda Deegan, John Hobbie, Bruce Peterson, and Anne Giblin. These researchers especially focused on the effects of carbon and nitrogen on organisms in the Plum Island Sound. Because three different watersheds enter the Plum Island Sound, nutrients travel from a diverse landscape into the Sound. For example, fertilizer applied to adjacent agricultural land is washed away by irrigation or rain. The fertilizer byproducts then enter a river or other water source, which run to the Sound. Wetland vegetation, microbes, and phytoplankton in the Sound then take up the fertilizer byproducts. Ecosystems Center researchers initially focused on measuring the amounts of organic and inorganic carbon and nitrogen in the Plum Island Sound. These nutrients have important consequences for coastal ecosystems. For example, phytoplankton in the water rely on inorganic nitrogen, such as ammonium and nitrate, most of which comes from human-produced wastewater and fertilizer run-off. If there is too much inorganic nitrogen available, this can cause the phytoplankton, including algae, to dominate the ecosystem. This is called eutrophication and is considered harmful to the ecosystem because the phytoplankton deplete oxygen in the water, which causes other species such as fish to die. The growth of phytoplankton does not just depend on the amount of nitrogen in the ecosystem. It depends on the form that nitrogen is in, its concentration, the ratio of nitrogen to other nutrients, and the metabolic processes of microbes in the ecosystem. Ecosystems Center researchers set out to examine these processes. For example, Joseph Vallino and Charles Hopkinson created a mathematical model based on inputs of organic and inorganic nutrients into a coastal estuary, as well as other factors. The steps in the mathematical model represented how the entire estuary biotic community metabolized those nutrients. Vallino and Hopkinson then used the model to show the impact of different ratios of nutrients, and other factors, on the overall ecosystem processes. The NSF’s LMER program was not set up for long-term studies like the Long Term Ecological Research (LTER) program, but there were many similarities between each program’s goals. In 1996 the NSF considered merging the LMER project with the larger LTER project. Scientists from the NSF, LTERs, LMERs, and the US Joint Global Ocean Flux Study convened to discuss the future of the LMERs. John Hobbie and Charles Hopkinson from the Ecosystems Center participated in this conference in Madison, Wisconsin, in July of 1996, and Bruce Peterson participated electronically. The group unanimously recommended that the LTER program should expand beyond land to include “land margin, oceanic and other marine systems.” Soon after, the LTER program awarded several marine and coastal-focused projects, and the LMER was discontinued. The Plum Island Ecosystem project was the first LMER to become and LTER in 1998. The NSF granted Ecosystems Center researchers nearly five million dollars in 1998, and the site became known as the Plum Island Ecosystem (PIE) LTER. PIE aimed to continue the LMER research on organic carbon and nitrogen, their impacts on the food web, and modeling the effects of nutrient run-off on coastal systems. Beyond measurement and modeling of nutrients and organisms in the ecosystem, researchers also conducted experiments. Some of the long-term experiments at the PIE LTER focused on nitrogen fertilization of marshes and tidal creeks. Researchers collected baseline data (such as water level, water quality, and nutrient concentrations), added nutrients to the system, and then tracked ecosystem changes based on the added nutrients.